Bitmap Mode is probably one of the least used modes in Photoshop. In Bitmap Mode, a 1-bit pixel can only be black or white(transparent for printing). This puts a limitation on things you can do. For example, you can’t use filters, or burn/smudge tool, layers, adjustment, and there’s no anti-alias option. Halftone is often used for creating shading patterns in illustrations, especially digital comic art. In this tutorial, I’d like to share with you something I learned from Kai Krause 14 years ago. It was an era when Photoshop had no layers. It took three different images just to produce a drop shadow effect. Eek. We’re going to create a poster of Jimi Hendrix, made up by tiny versions of itself. A recursion effect, if you will. The concept is really simple: We shrink the original image to a tiny size, define it as a custom pattern. Then convert the original image to bitmap mode, using the custom pattern. Keep in mind this tutorial isn’t too useful for web graphics, due to its size. However, it’s great for a large poster. 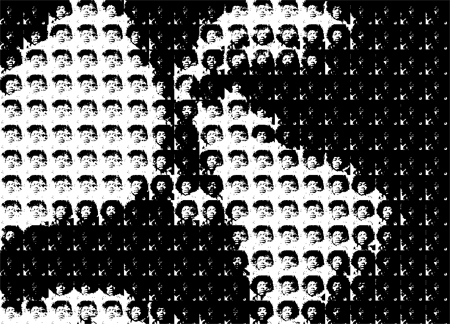 The image I picked for this tutorial is the grayscale photo of Jimi Hendrix shown above, titled jimi_normal. 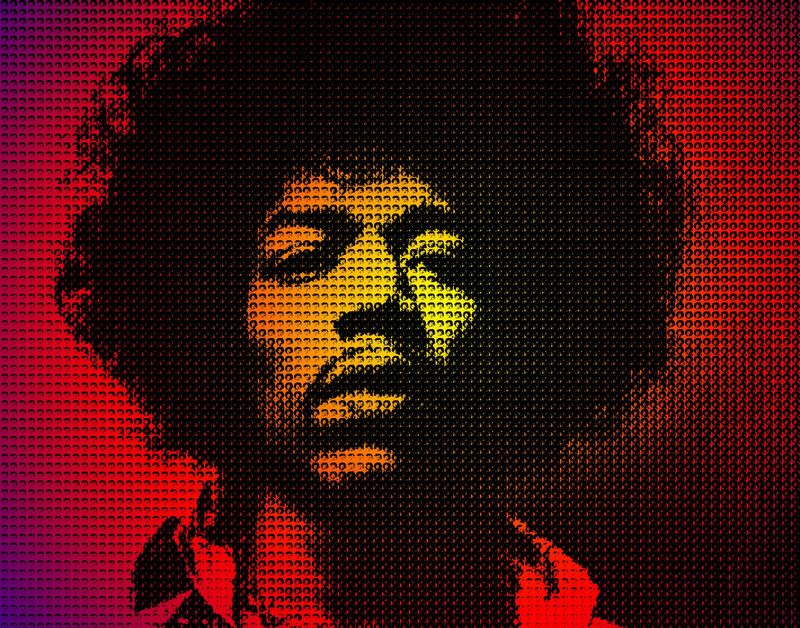 Duplicate jimi_normal (Image->Duplicate), name the new image “jimi_pattern”. Drag a perfectly square marquee(hold shift while dragging) over the new image, centering on Jimi’s face. Then (Image->Crop). Now your image should look like Figure 1. Next, we’re going to heighten the contrast to look like Figure 2. Go to Image->Adjustments->Level. In the level menu, input the following values. You can play with different settings. The point is to make the photo high contrast. Now we’re done with the pattern. The reason I picked 60x60px is because the final output image will be 300dpi. So the pattern will tile 5 times horizontally and vertically. Feel free to adjust the size for your desired output size. 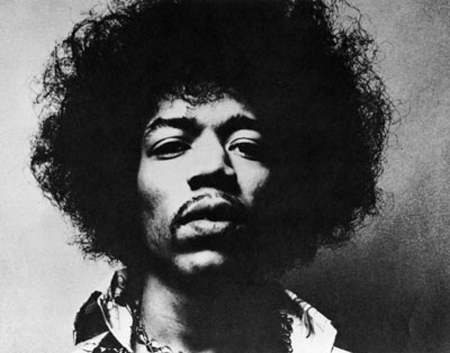 Now go back to the original photo, Jimi_Normal. Let’s resize the image to 5400x4200px, 300dpi. 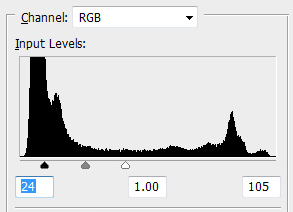 If you plan to use a RGB photo, you need to convert it to grayscale mode. You can only convert to bitmap mode from grayscale. At this point you can feel free to play with the contrast of the photo by using the Level tool or Curve. Since I’m quite happy with the original, I’m going to remap now. Go to Image->Mode->Bitmap. 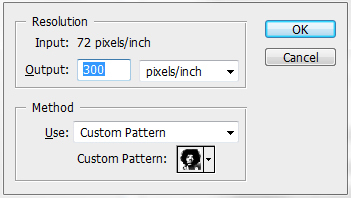 In the Bitmap option window, for Method, choose “Use: Custom Pattern.” Then pick “Jimi Pattern” we defined in Step 1. If you zoom in a bit, you’ll see the mini Hendrix. We’re done! That was easy. As long as you understand the concept, play with different image output. The bigger the original image’s resolution, the better the output will be. Also, don’t try to make the original photo’s contrast too high, it’d affect the smoothness of the bitmapped version. I’d stick with 300dpi for best print quality. The bitmapped version is comprised of only black and white pixels. This makes it easy to use the magic wand to copy and paste onto a RGB mode image. You then can combine other techniques in your possession to spice up the image some. Here I just added a simple rainbow background using the radial gradient tool. Click on it to see the full size. Hope you enjoyed this short tutorial. I’d like to see what you come up with. That’s an interesting effect. Can you do that by saving into actions? That’s a great tutorial and technique. Never found a use for Bitmap Mode up until now. Thanks for sharing.